You may recall that we decided on Top Bar Hives for our homestead, but beyond the general category of hives we still had to pick an actual design and find or create some plans. Some of the options were all wood top bar hives that look like miniature Noah’s Arks. Others are designed to be built from scrap material available in 3rd world countries and/or areas affected by disaster. Martha and I were interested in a design that we could assemble ourselves to gain experience with our hands, increase our skill sets, and have a greater appreciation for the end result. 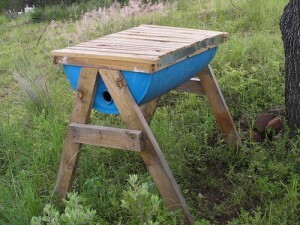 We were also looking for a design that was inexpensive yet sturdy enough to last. There were also some practical considerations: it had to fit in well with our plans for our yard, the entrance should be such that the bees would not be encouraged to fly directly out into our neighbors yard or towards where we might be relaxing on our deck, patio, or lawn, and the c0mponents of the hive should be readily available to us. During our search for top bar hive designs we visited many different websites. One of the most useful sites was Gold Star Honeybees. Not only do they have some great looking hive products but the instructional video series on their YouTube Channel offered a wealth of tips and tricks for beekeeping using top bar hives. 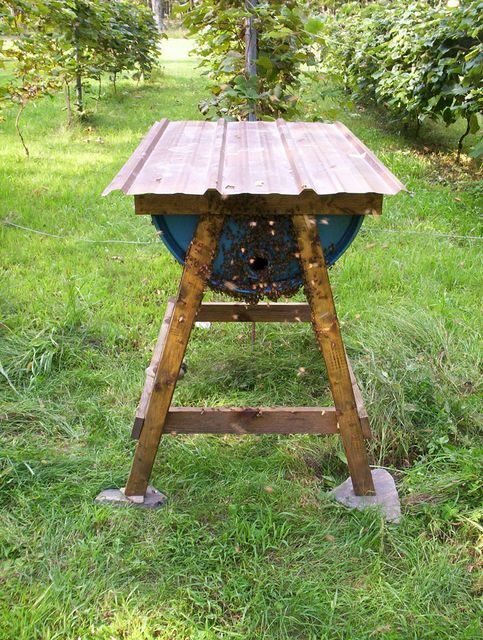 The site that was one of the largest contributors to our inspiration was on Robo’s World blog about a Top Bar Hive (TBH) made from a 55 gallon barrel. This barrel based TBH design resonated with us as being very affordable, simple to build, all the materials were readily available to us, and one barrel provided TWO hives! We also liked the re-purposing of the barrel so that it could see another life. Other TBH designs we saw reminded us a lot of Langstroth hives in that they were on the expensive side and looked almost too finished for us. Not that there is anything wrong with Langstroth hives or the pre-made professional grade top bar hives, it was just not the look, experience, or price point we were trying to achieve. Part of this endeavor was to build up our personal building skills so we wanted to make sure the hive we settled on was something that would push us to learn new abilities. After a little searching I found this “Instructable” which gave some “pretty good” instructions for building your own barrel TBH (I’ll discuss the difficulties we faced and changes we made in later posts).It turned out there is a local supplier of used barrels from which we could purchase a food grade barrel for the TBH. The rest of the materials were easily obtained at the hardware store. Us being new homesteaders meant we were sorely unprepared for the task of building these hives, even as simple as the instructions were. In preparation for a big trip to the hardware store, we stopped by our local Post Office to pick up some coupons. Most Post Offices offer “change of address” form packets which contain coupons to many stores, including the major home improvement store we frequent, good for 10% off your purchase. That can be a good chunk of change if you are at all like we were and needed things like a circular saw and a work bench, not to mention all the raw building materials to assemble the hives! Check back later to read about how we built our own barrel top bar hives! Keep reading about our beekeeping!